Do you know about CeDe Higgens?? (sometimes misspelled Higgins) CashnCarey Puppies are in his lineage. He was quite impressive and beautiful!! Google him! 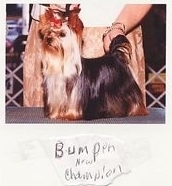 CeDe Higgins is an American Canadian Champion...the only Yorkshire Terrier to win Best in Show at Westminister !!! 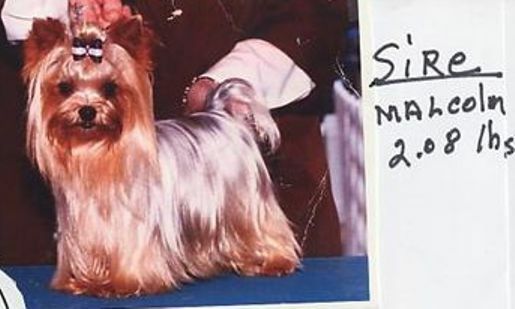 The 1978 Westminster's Dog Show in Madison Square Garden was on Valentines Day when his Handler Marlene Lutovsky wore a red dress, and CEDE Higgens, 5lbs, wore a red bow with white polka dots. After deliberating 17 minutes, Anne Rodgers Clark one of the most famous dog show judges of all times gave CEDE Higgens Best in Show. "He has to be the best Yorkie I've ever seen, and he showed his heart out," Clark remarked at the time. "A great showman, exceptional competitor, and beloved companion, he leaves an unparalleled legacy of excellence to the Breed." CashnCarey Puppies have Malcom as their "grandpa". Malcom puppies were quite sought after as he was only 2 lbs! CashnCarey Puppies don't usually follow the "triple their weight at 8 weeks" rule. They are maybe closer to "double their weight if that!" They are known to start out good sized and somewhere along the way they quit growing! Bumper has sired the last two litters of Carey's. (1-08 and 2-09) Currently I have three pups sired by him; Little Bit of Cash and Annie and Andy. And then there's the infamous Connor! Cash was bred to Conner - Chobie's Trice Th'Con Man. Big Daddy to Tinie (DOB June 2007). He's the same sire to Pee Wee (DOB12-06) and Itty Bitty-both from Cash born February 2005. 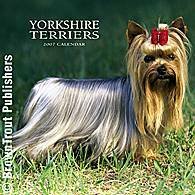 Conner was featured in the 2006 Yorkie Weekly Engagement Calendar and also their Address Book published by Browntrout publisher! Conner is the Cover Yorkie for the 2007 Yorkie Calendar published by Browntrout Publishing shown below. He and Cash are the proud parents of Tinie, PeeWee and Itty Bitty.